Even ultrathin ultrabooks are launched with some fanfare, with branding and markings designed to attract the eye. Not so with AMD's new prototype PC. This isn't room for much branding. It's so small I thought it was a nameplate. 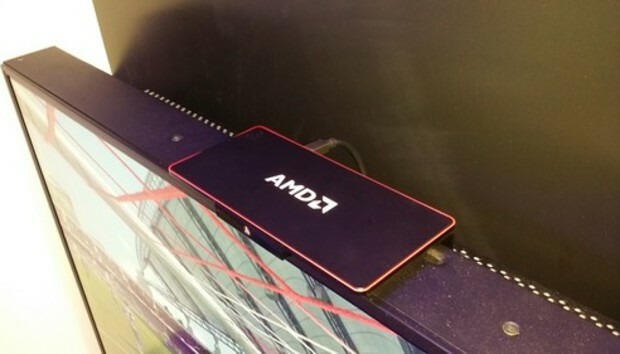 AMD showed off the the slimline PC, which is based on its upcoming "Mullins" chip, at its press conference here at the Consumer Electronics show, alongside the "Discovery Project," the fancy name for a prototype tablet and gaming sleeve that the company also developed for the show. Neither seems to stand much of a chance of being shipped commercially, but each gives some idea of AMD's intended direction. The Discovery tablet, for example, is roughly the size of the Intel-powered Microsoft Surface, although somewhat lighter. Lisa Su, the senior vice president and general manager of global business units at AMD, took aim at the Intel "Bay Trail" chips. "What we were trying to put together with Mullins is a true no-compromise chip," Su said. This is extremely low power, extremely high perfomance, to meet your desktop expectations in mobile form factors. I want to tell you that Mullins and Beema [chips] are doing great. They've been in the lab for many months now, we've shipped many samples to customers, and the feedback is has been phenomenal." From a graphics perspective, Mullins and Beema both perform over 250 percent faster than the Intel "Bay Trail-T" chip, Su said. "When you think about tablet form factors, they're extremely good for consumption, but not as a good for 3D gaming," Su said. To show off the power of its mobile hardware, AMD built the Discovery tablet, an 11-inch tablet built around the Mullins CPU. It will not be brought to market, Lisa Su was quick to point out. Nevertheless, the tablet itself is slim--thinner than a Surface, perhaps, and a touch lighter as well. (AMD executives did not have actual specs) And like the Razer Edge, AMD even built its own game cradle to hold the tablet. AMD even demoed Pro Evolution Soccer 2013 on it, to show off its performance chops. AMD also built Mullins into a second form factor (at top), an unnamed form factor that I completely missed on first glance. The small, slim chassis was about the thickness of a smartphone, and about the size of a business-size mailing envelope. Inside was a Mullins chip, an SSD, a Webcam, and the requisite connectors for driving another implementation of Pro Evo Soccer on a second display. As you might expect, both prototypes will serve as reference designs, signposts to guide AMD's hardware partners. We're starting to see hardware manufacturers less afraid of at least showing non-traditional form factors and designs. Still, it's going to take a prominent design win or two to help break out of the traditional PC mold. A new generation of chips from AMD, ARM, and others, however, are beginning to enable that future.